Do you love unique metal work and sculptures? Want to try your hand at repairing wrought iron fencing or fixing that broken bicycle? 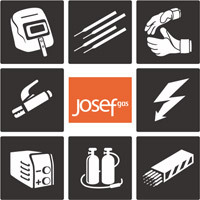 If you are new to welding and need some advice on getting started, begin with a visit to Josef Gas! We carry all the welding supplies you need to get started or expand your hobby. Welding is a fun hobby that can become a great way to earn some income if you get good at it – simple repairs, automotive work, selling your pieces at festivals and fairs, or maybe you’ll love it so much, you look in to it as a full time profession! There are many different types of welding. Beginners usually start with some form of stick welding. MIG welding is the easiest process to learn and requires the least amount of skill to create a good weld. It’s a great way to get your feet wet. Once you are comfortable or if you want to explore different techniques, you can move on to explore other methods. You can learn more about the specific welding methods on our blog. We also recommend starting your new hobby with a basic class. Local vocational schools and art centers may offer classes or you can reach out to professional welders to see they would be willing to show you the ropes. If you just want to learn more about welding in general and try out some equipment before you take the plunge, visit Josef Gas at 201 Basaltic Road, Concord, ON. Our showroom is fully stocked with the latest welding supplies. Our staff is very knowledgeable and would love to talk with you about your potential new hobby. We can advise you on gear and offer advice or resources you may not be aware of. Stop in anytime we are open – no need to make an appointment! We look forward to seeing you soon!